Puppies spend a great deal of time playing, chewing and investigating objects. All of these normal activities involve puppies using their mouths and their needle-sharp teeth. When puppies play with people, they often bite, chew, and mouth on people’s hands, limbs, and clothing. This kind of behavior may seem cute when your puppy is 7-weeks old, but it’s not nearly so endearing when he’s 3- or 4-months old and getting bigger by the day! Approximately 4.5-million people are bitten by dogs in the United States every year and 20% of them will need medical attention for their wounds. Children are the most common victims and half of bite wound victims are younger than 13-years old. Children are much more likely to be severely injured by dog bites due to their small size and a lack of awareness about how to act around a dog. Most dog bites occur while interacting with familiar dogs, which is why there’s a need to educate people and their children on how to avoid dog bites. 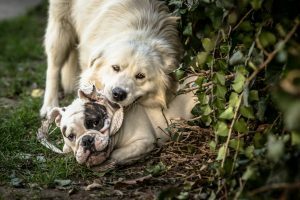 It is important to understand any dog has the ability to bite; by understanding the common reasons why dogs bite, it is possible to prevent them. Do you have a chihuahua, bulldog or pit bull or another type of dog with a biting problem? Our team at Come & Train It K9 helps dogs and dog owners in Houston with effective training so your pup won’t bite. Give us a call today to discuss your needs. We have a tremendous success rate with training aggressive dogs. We’d love the opportunity to work with you and your pup!